"A teacher and professor, an accomplished and prolific writer, Noel Sloboda brings readers something to enjoy with Shell Games. Seeking to explain how we grasp the truths and reality that surround us day by day, his work is enlightening and eye opening, not to mention entertaining. 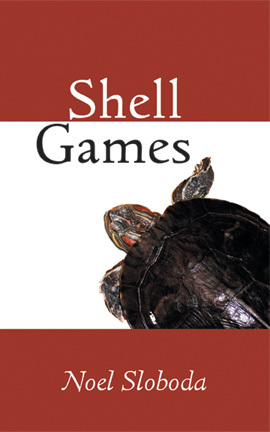 Shell Games is something to consider for any regular poetry reader." "Sloboda’s poems are a bit of an enigma; not unlike those of Collins or Kooser, they make use of simple language to deliver surprisingly intricate and profound treatments of everyday existence. They are not quite nature poems, although 'Shell Games,' 'Winter of the Campaign,' 'Fallen,' and several others have a distinctly rural sensibility; the sense of a physical topography, a terrain that is being actively explored, is palpable in this impressive first collection." "Just beneath the domesticated surfaces of these poems we glimpse portents of fear, grief, and rageonly a circumstance away from turning feral: kittens become hissing cats; a broken turtle suggests unseen sources of violence; a jobless husband waits, cornered, for the return of his working spouse." "Noel Sloboda’s poems are life forms. They breathe. They are glad to be alive. They pull out onto the highway, roll down all the windows, and take you along for the ride." Named a JulyAugust Pick by Small Press Review. Featured in an article by Penn State York. In Shell Games, Noel Sloboda surveys the landscape of daily life and the deceptions commonly encountered there. Reveling in the artistry of the ordinary, Sloboda examines how we endeavor to grasp truths about those around us as well as ourselves. Readers will find both poignancy and possibility in the quotidian dramas of this collection. Noel was interviewed by Keyhole Magazine.